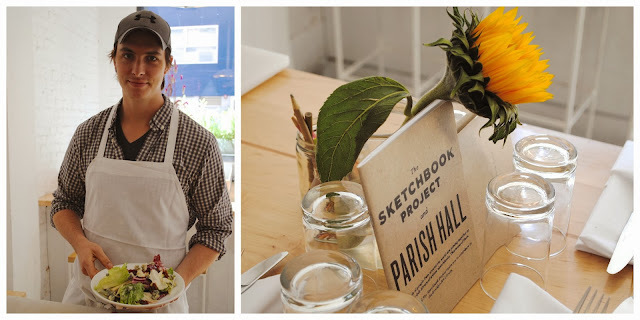 During the day, Parish Hall restaurant in Williamsburg is sun soaked. Sunflowers bloom on each table and the minimalist decor is calming and inviting. Owner George Weld and Chef Evan Hanczor have put together an operation that achieves what many Brooklyn restaurants strive for, and they take terms like "knowing the land," "local," and "farm to table" seriously, even if those words aren't conspicuously printed all over the menu. How do I know? For one, Weld grows produce used at the restaurant at his farm, Goatfell Farm, in Upstate New York. I've been to the farm, and it's beautiful. Chef Hanczor told me that every Fall, Weld takes his staff on an "Eggscursion" upstate to work on the farm for a few days. They sleep in tents, tend to the fields, upkeep the greenhouses and eat really well. It makes the romanticized idea of farm to table, like this "Chicken Farm" scene from Portlandia, seem like a reality and like a really good idea. The focus on knowing-thy-farmer is central to what Parish Hall is all about. During my visit, as though perfectly timed, a farmer dropped off a whole goat as I was leaving. Chef Hanczor and his team butcher the goat whole at the restaurant. While I can tell you that Chef Hanczor cooks a mean goat, I visited the restaurant to try making something far simpler, but just as satisfying: Radicchio and Escarole Salad with Smoked Walnuts and Ewe's Blue Cheese. You'll find it on the menu at Parish Hall, or you can follow this recipe to make it at home. This is a versatile salad. It can be served at lunch with good bread as a meal on it's own, or supplemented with the addition of a poached egg on top. For dinner, Chef Hanczor suggests serving it along with something rich—a well-seasoned rib eye steak or even roast duck. Or, you can dumb this salad down for more picky eaters (we know who you are). Romaine replaces bitter greens well, and cheddar can pinch hit for the rich ewe's blue cheese, a hearty sheep's milk blue. The most important point to making this salad a success is the quality of the ingredients. New Yorkers struggle to find good produce during the winter, but the ingredients here lend themselves well to the colder months and aren't difficult to find. I know Chef Hanczor used quality ingredients when a small, green ladybug crawled out from the head of escarole. Nothing says fresh like a happy visitor from the farm. In a small bowl, combine the walnuts, oil and honey. Heat a small saute pan over medium heat and add the mixed walnuts. Toast the walnuts, tossing frequently, for 1-2 minutes until the honey sizzles and the walnuts begin to brown. Remove from the heat. Combine the escarole, radicchio, pear, mint, parsley and candied walnuts in a large bowl. Toss with the dressing until well-coated. To serve, divide the salad among two plates and top evenly with the blue cheese. Serve and enjoy. This will make a few cups worth of dressing, but it can be halved and also saves well in the fridge for a few days. Whisk the egg yolk, cream, shallot, orange juice, lemon juice, vinegar and honey in a large bowl. Begin incorporating the canola oil by drizzling it into the mixture in a slow, steady stream, whisking continuously until you have created an emulsified dressing. Add in the squash seed oil and whisk to incorporate. Season to taste with salt and pepper. Thanks for the food menu. Lose weight This menu and exercise. The menu is delicious and also makes a good figure.